This week on Supergirl, there’s a whole lot of failing going on. Kara is trying to get Mon-El adjusted to Earth (and failing at it), James Olsen is trying to be a superhero (and failing at it), and Alex is trying to be heterosexual (and failing at it). It’s all good, though, because everyone is on their way toward a wonderful personal journey by the end of the episode and that’s all we ask for from our superhero episodes, right? Well, and some good pacing and good characters and good character development... which this episode, unlike last week’s episode, actually has! So yay! The Big Bad of this season looks like it’s going to be Project Cadmus, the shady secret organization responsible for villainous experiments and the disappearance of Papa Danvers. Well, I guess the real Big Bad is the leader of Project Cadmus, what with her anti-alien philosophies and turning people into kryptonite-powered superweapons and her general air of xenophobic paranoia. Hey, does anyone else feel like Supergirl is trying to make some parallels to real world politics? Call me crazy, but I just get this impression that they might be going for a political slant this season. Project Cadmus might be great at the mad science experiments, but they’re not so great at picking and choosing their lackeys. This week, it’s a dumb greedy jock type who is given control of an alien gun and told to go make a nuisance of himself. Rob some places. Break a few buildings. Bust a few windows. You know — the sort of things that the heroes in modern DC movies tend to do on their own. This time it’s the bad guy doing it, though! Ain’t that a novelty. I don’t even know Dumb Greedy Jock’s real name and I don’t feel like learning it because he’s doomed to a frothy death by the end of the episode anyway, so he’s just Dumb Greedy Jock now and forever. Anyway, Dumb Greedy Jock is supposed to be using his alien weapon in public, terrorizing the National City citizens, so that Project Cadmus can release a super freaky hacker-style video about how the human population had been warned that welcoming aliens into the country wouldn’t end well. Because there’s no such thing as logic when you’re a paranoid, xenophobic organization bent on fulfilling your own prophecy, they conveniently leave out some key facts — not the least of which is that the whole thing was a set-up to make aliens look bad. At least one guy in the CatCo offices falls for the faux act of terror, but I’m not sure how much weight to give his freak-out because he just wanders around in circles like no one on set gave him any actual direction before telling him to say his lines. He does get to say the words, “The Second Amendment gives us the right to bear arms, even if those arms are rayguns” though, which is hilarious. During the attack, James tries to get involved and punch a bad guy or two in the face. He does an okay job at holding his own — better than okay, maybe, since Team Dumb Greedy Jock was armed with alien tech — but ultimately, it is his face that gets punched. Poor James’s face. Also, to add a terrible cherry on top of the rotten sundae, James’s camera gets run over when the bad guys flee the scene — the camera that he got from his dad. The really, personally important camera. Sigh. Poor James’s nostalgic emotions and human feelings. Thus begins James Olsen’s journey to superherodom. At first, it’s just sneaking out to try and punch more faces, armed only with a baseball bat and costumed only in a mask. But that turns sour real quick. Not only because he’s still just a human in a hoodie, but also because he doesn’t even know enough to zig-zag when people are firing weapons at him. Come on, Olsen! Fleeing in straight lines? What is this, that one scene in Game of Thrones? Ugh. I had higher expectations for you, man. And going to Winn for help? You’re full of terrible ideas this episode, James Olsen. You’re lucky I like you and also like the idea of you becoming a superhero. Also, I kinda feel sorry for you because you said your best friends are both superheroes, which makes me think that you think your best friends are Clark/Superman (a guy you never see) and Kara/Supergirl (a woman you never see, who also rejected you). That’s rough, buddy. There are more journeys this episode, though! Unfortunately, one of the journey centers around Mon-El being a clueless douche and I don’t care about him so here’s a summary: Mon-El is a clueless douche, Kara wants him to behave on Earth, she realizes that it’s not her job to babysit him, he gets fired from his job and learns very little. Whatever. The other journey is more interesting, because it involved Alex and the realization that she maybe (definitely), possibly (definitely), could be (definitely) attracted to Maggie. She blurts out the almost-confession to Maggie in a bar and then runs away from the awkward, but I know it’s going to end well for those two crazy kids since Maggie’s looking pretty smug about the whole thing. Oh right, there’s more going on than personal growth and discovery. 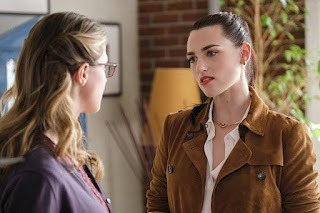 Lena Luthor is throwing a gala fundraiser to help raise money for a children’s hospital that got damaged during the Dumb Greedy Jock attack downtown and invites Kara along because they’re future BFFs. Kara, of course, is thrilled and accepts the invitation immediately — and then later Lena Luthor asks if she can get in touch with Supergirl, because Supergirl is also invited to the fancy party. Uh-oh! I sense the arrival of some wacky double-date hijinks, everybody! Mostly because the show has apparently forgotten that J’onn can shape-shift into Kara and make this whole dilemma disappear. Did he protest against wearing a skirt or something? Dumb Greedy Jock goes against Lady Cadmus’s direct orders not to mess with Lena Luthor’s shindig because he’s a Dumb Greedy Jock and of course he did. As a result, he falls into Lena’s trap (Lena, by the way, is super adorable when she’s helping and being a hero and I want her to be a real part of the team so much). Lena has built a techno-babble-fueled shield thing out of Science™ and uses it to neutralize Team Dumb Greedy Jock’s alien weaponry. Kara looks a little proud of Lena when she congratulates her (as Supergirl) on her genius plot and Lena looks all bashful about it. I have never wanted a character to not be evil more than I want Lena Luthor to not be evil. Unfortunately, Lena Luthor’s whole upbringing and family are shrinking the chances of her coming out of this season a hero by the second. Not only is her brother the famously villainous Lex Luthor, but her mother is (DUN DUN DUN!) the leader of Project Cadmus and all-around very bad person, Lillian Luthor. Hey, Lena is adopted, right? That means she still has a chance to be on the side of good and join the Supergirl team permanently? Please? Kara gives Mon-El a haircut by eye-lasering it into a suitably preppy-hipster style, and I have so many questions. Most important question: Kara got her hair that perfect with eye lasers? I can’t believe how little Mon-El knows about the world, but they’re still shoving him into an internship like it’s no big deal. I actually have to sympathize with the guy. There’s a threshold for confusion for most intelligent beings, and he probably reached it as soon as he stepped into the CatCo offices. No wonder he just gave up and started goofing off. "She dumped you? Who would do that?" Oh, Alex. Lena and Kara’s interactions with each other are always full of glowing smiles and enthusiasm and I love it. "I kind of missed you from CatCo, man." Don't lie, James, it's beneath you. No one misses Winn, ever. "I'm feeling confused about something." Oh, Alex. Times two. Wait, James has a blackbelt? Fingers crossed that Kara and Mon-El are never, ever a thing.